As the premier provider of arboricultural services, Ace is the most trusted name in healthy trees and shrubs. Our knowledge and expertise has enabled us to provide clients with the highest level of care since our beginnings. At Ace we understand that the trees and shrubs surrounding your home are your personal piece of nature. That's why we take a natural approach to the care of your surroundings. The certified arborists and technicians at Ace are dedicated to every property under their care. Each of them is a friendly and knowledgable source of information about the tree and shrub species that compromise your landscape. Ace have access to the latest techniques, tools and products to deliver state-of-the-art plant health care. 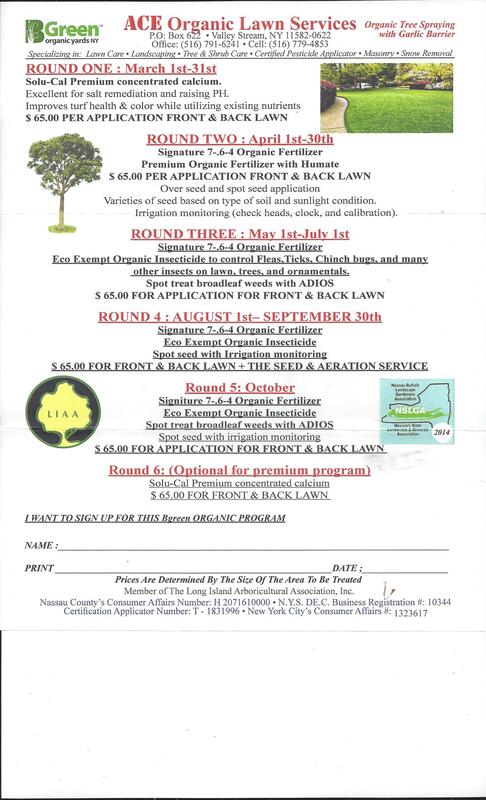 Call Ace to discuss the appropriate tree and shrub care program for your landscape objectives. Ace's approach to tree and shrub preservation is tailored specifically to your landscape’s plant material. With our program, your trees and shrubs are monitored throughout the growing season and early fall for signs of insect damage, disease and environmental stress. Existing conditions are treated on the spot. Insect populations are kept from growing to unmanageable levels. Diseases are caught in their early stages. Environmental stresses are identified before damage becomes permanent. Beneficial insects (insects that prey on pests) are left undisturbed and the amount of toxins used is vastly reduced. Ace's program is an environmentally conscious approach to tree and shrub health care and preservation.